When I was growing up (in Arizona) my father made certain to show me evidence of Western history and culture. Western as in cowboy. 50s/60s TV helped. Not balanced or historically correct. And, living in Arizona, we got to travel around the State and visit places like Montezuma’s Castle and Tombstone. And I really wanted to own a horse and become a cowboy. At age 5. Part of what was taught to me was the difference between Cochise and Geronimo. 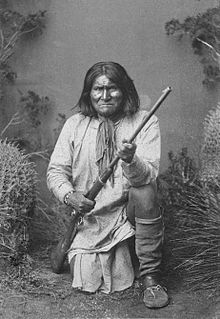 Cochise initially fought the incursion of people from the East Coast, but eventually acceded to what was called manifest destiny and gave up. I was taught he was a great hero of his people. (See the 1950 film Broken Arrow for the politically-correct story). But Geronimo was another matter. A warrior to the end, he never gave up fighting for his people, and was eventually captured and made a prisoner of war. He died in captivity. Some say he was murdered. I was taught he was a rebel and criminal who deserved what he got. We called these battles The Indian Wars. Between the Indians co-existing with us as citizens, having their own ‘nations’, and being given special status and benefits from the government (based largely on our guilt for never honoring treaties and mistreatment of them), AND, the ever-popular meme of Jean-Jacques Rousseau’s The Noble Savage (the idea that as they were primitive cultures they were automatically more pure than we ‘cultured’ euro-trash) it’s a pretty complex relationship. Until the 1700s, many conquering forces simply eliminated those who didn’t assimilate. Less complex but barbaric. We did do some of that. Special status, in spite of the whole melting pot meme; E Pluribus Unum, and equal rights for all. Some people are more equal than others. As a youth, I admired Cochise for his peaceable acquiescence to federal government authority. I tend to be siding more with Geronimo, now. And you would give in to another government trying to take us over?? Of course not, if we are the Constitutional Republic we aspire to be! The photo you have there is not Cochise. It is Chato, another Apache leader. 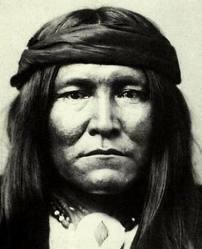 Chato was a Mescalero Apache and not Chiricahua like Cochise. Thanks. It was one provided by the Internet.